When the icon is outlined in green, Radial Plots are active. 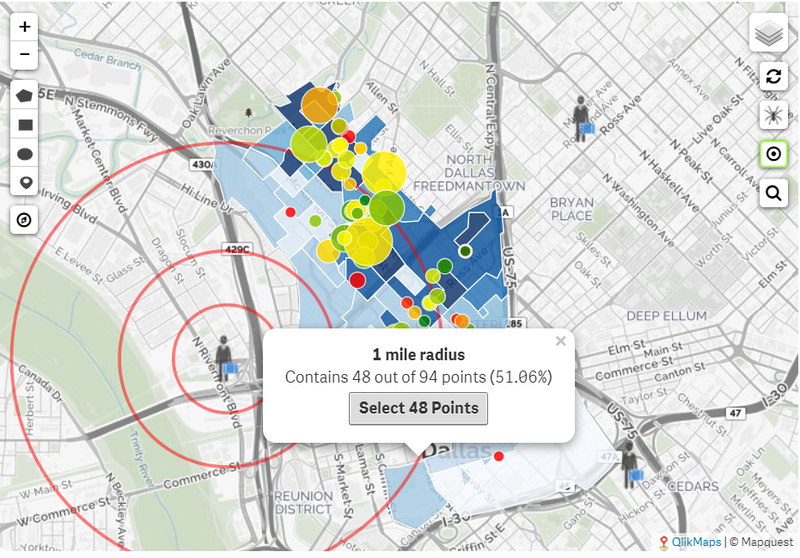 On clicking a point while Radial Plots are active, radials will appear on the map centered on the clicked point. You can click on each radial for information. The Select button will select all features within the radial. For any given point from source Point Objects, QlikMaps will use the Radial Plot expression from that source object Radial Plot expression. For any pseudo-point that does not come from a source object (added from search results, dropped as a custom marker, etc. ), QlikMaps will use the Radial Plot expression from the Multilayer Object. Using the ntile and fixed methods will incorporate all points across the visible source objects. Using the contribution method will aggregate only the points from the same source object. Occasionally the spider chart button will disappear when the expression is modified. To resolve, navigate to another page and return. Beginning with QlikMaps 3.0, customized expressions are not necessary to build radials. Select the Radial Plots caption under any points layer and select from the drop down the type of Radial necessary. More information can be found regarding the available options at Points - Radial Expression. For more granular control a Sense expression can be used to create radials. The template below shows the expected responses to generate radials. All radial expressions must result in a comma-delimited list of arguments. The first argument tells QlikMaps which radial method to use. Subsequent arguments vary by the radial method and are described below. The FIXED radial method creates radii for every argument given. By default, QlikMaps assumes that the unit of measurement is miles. The arguments can be static, or they can be exposed to end users as a variable so they can specify the distances of the radii on the fly. Example 2: Create radii at 1 km, 3 km, 5 km, and 6 km. Show kilometer units of measure in the popups. The NTILE radial method only requires one additional argument to tell how many ntile radii to plot. Ntiles are calculated by a count of points.